This accessory is a two piece Neoprene chest strap. Each strap, short piece of webbing sewn to the Neoprene pads, overlap each other and attach via velcro in front of the client. Tri-Glides are woven on the straps for tension adjustability. At the ends of the straps are easy to install belt anchors. This accessory is beneficial for the client who needs support to keep them back in the chair. The belts can be installed on lateral supports, the solid back, or the wheelchair frame. 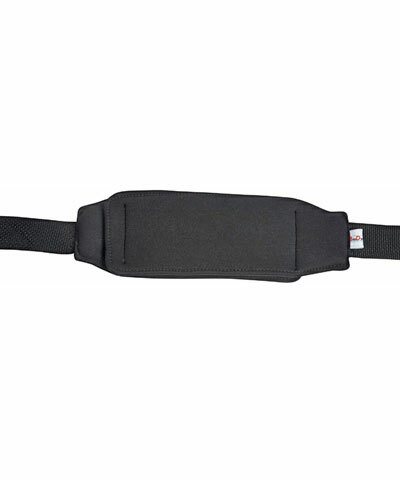 The BioForm Chest Positioning Belts are beneficial for the consumer who needs assistance in keeping their upper trunk in contact to the solid back. These Positioning Belts can be installed to the Lateral Trunk Supports, to the Solid Back Inserts or to the wheelchair frame. The BioForm Stretch (Black Neoprene) Chest Positioning Belts are available with a pad of 8 ", 11 ", 14 ", 17 " and 20 " in length. They come with velcro closure to allow for a quick setup. Each strap, short piece of webbing sewn to the Neoprene pads, overlap each other and attach via velcro in front of the client. Positioning Belts have tri-glides for easy adjustment and end fittings for convenient mounting. Available in x-small, small, medium, large and x-large. Custom sizes available by selecting the appropriate model #. If color other than Black Neoprene is desired, replace the last two letters of the model number (NB) with those from Color Selection section. i.e.- PDD-NB becomes PDD-NE when color Eggplant is desired.